We started with the first cellar I visited last time, but things have been moved around. You've got some top Italians, Australians and Champagnes here, like this nice pile of Krug Clos d'Ambonnay and Clos de Mesnil. Then we enter the inner sanctum - where the most treasured bottles are kept. 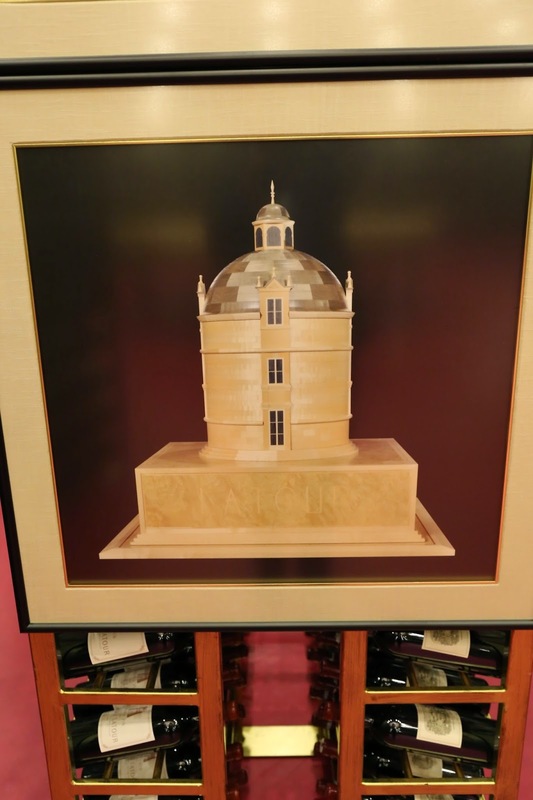 The first thing one notices is a section of old and rare Petrus and Lafite-Rothschild... This is also where the oldest and rarest of German Trockenbeerenauslese are kept - some of which list for over USD 15,000. This bottle of 1921 Staatlichen Weinbaudomäne Niederhäusen-Schloßböckelheim Schloßböckelheimer Kupfergrube TBA - with a nice little swaztika on the label - lists for MOP 65,000 or over USD 8,000. They still got a not-inconsiderable collection of Henri Jayer - including the 1959 and 1962 Richebourg... and the '59 has now gone up from MOP 200,000 to 280,000 a pop. The other treasures I saw from last time were still here - bottles like 1921 Yquem, 1961 Jaboulet La Chapelle, 1959 Romanée-Conti... Stuff that's on most wine geeks' "bucket list". We moved on to one of the new cellars - which was seriously eye-opening in a different way. There's a large round table in the middle of the room, which seem to be the perfect place to hold a wine tasting. Radiating outwards are rows and rows of wine racks, and some of those racks consist entirely of wines from a single château or a domaine. 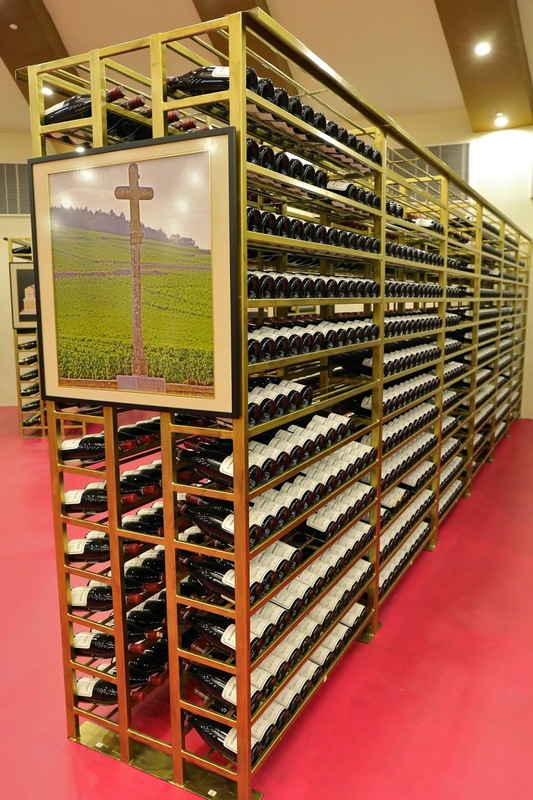 A few of these racks are easily identifiable by pictures of the architectural wine cabinets made by Viscount Linley which corresponds to the châteaux (the actual cabinets are on display at Robuchon au Dôme). ...and this rack of Yquem has a picture of the Yquem cabinet on the side. No guesses for what's on this rack. Finally, we were shown a third cellar which held only the Germans and US collections. Hotel Lisboa quite possibly owns the most impressive collection of German wines anywhere on the planet - especially when it comes to high end wines like BAs and TBAs. The listing for TBAs take up almost 50 pages of the wine list. and yeah, every single box you see here holds Screagles. That was some tour! The people at the Lisboa probably figured they're dealing with a couple of guys who know something about wine, so we ended up with 3 people from the hotel (there were four on my last visit) following us the whole time. No backpacks are allowed in the cellars, we were told... and if there were any bottles missing after our visit... IT WASN'T ME! That's a stunning collection. Probably worth a book of its own.